WHAT IF SHE DOESN'T LIKE THE RING? What to do when you don’t know what to do? Selecting the perfect engagement ring for that bride-to-be can be overwhelming. 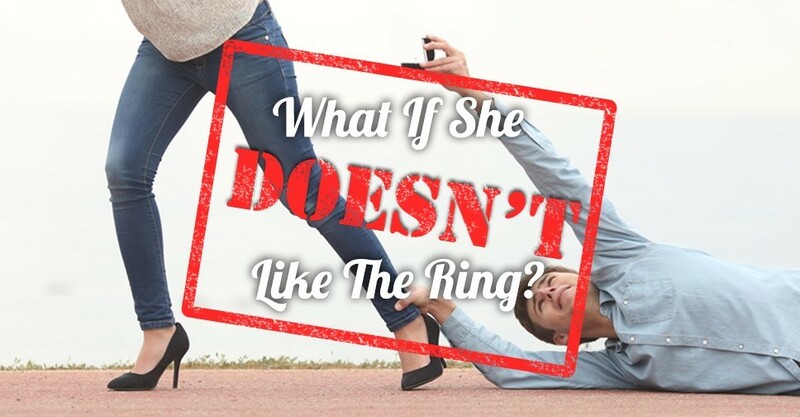 It’s a Catch-22; you want her to think the ring you have in your hand is exactly the one she would have picked out on her own, but it needs to be a surprise. In our 40+ years of experience, we have found that there is about a 94% probability that she is going to love the engagement ring you choose. However, we understand if you still have reservations and better yet, we have a solution. Remember the diamond is the focal point of the ring. Bring the engagement ring in and together you can choose a wedding band or even a wrap to compliment the solitaire setting. With certain solitaire engagement ring settings, you can even customize it with a diamond halo or add some pave’ diamonds down the shank. Sell back the solitaire setting. That’s right. Within 30 days of the initial purchase of non-custom solitaire rings, Shaftel Diamond Co. will give you 100% store credit for the setting. You will still have the stunning loose diamond and can shop our engagement ring settings together or create something completely custom. No matter which option you go with, Shaftel Diamond Co. will help you along this once in a lifetime experience. Remember, the odds are heavily in your favor that she will be completely enamored with the ring you propose with. Ready to learn more about selecting an engagement ring in Houston? Give us a call or contact us online.